Think Flapper! 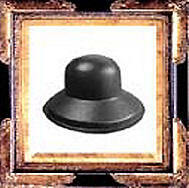 This very versatile hat shaper can be used for cloche crown with or with out the brim. Although the original cloches were made to hug the head tightly, the cloche eventually gave way to the looser fit and the large brims. So the artist can choose her own brim while knowing that the crown will have the consistent shape for any creations. The Cloche was made famous during the 1920's and worn elaborately embellished by the very rich yet made affordable for the very poor. 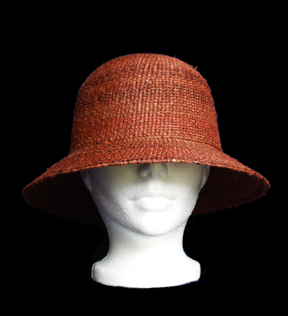 This is also a great tool for blocking the knitted wool fisherman's hats and conventional wool winter hats as well. The Cloche is on a base which allows for a clean cut at the brim. 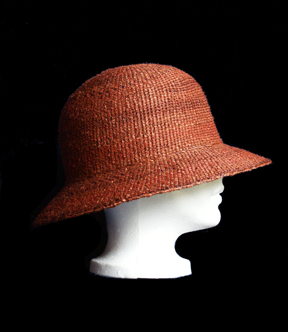 Raffia users enjoy this crown for the basis of many bonnets. Using a creative eye, one can see that this crown will be useful in many different styles of hats from across the centuries. Marlene Liddle of British Columbia made the gorgeous Bell Cloche from the inner bark of a Red Cedar tree. It tooks 2-3 days of preparation of the bark before weaving can begin. The bark then was dyed using cold fabric dye and woven damp to avoid breakage. Hat Shapers aren't just for wet felting! Purchase HandiCraftKates Hat Making Tutorials on Etsy!!! !